330 ml bottle served cold into a tulip. LCBO purchase for $3.50 CDN. Appearance - Brilliant pale straw colored brew, with a suggestion of hazy. Lots of carbonation beneath the long last brilliant white head that disperses lacing all over the glass. Smell - It's not quite Duvel, but the sweetness, spiciness and wonderful floral bouquet while adding grassy notes are all here, although dialed back just a bit. Taste - Same as the nose, a good impostor for Duvel, with the right amounts of sweetness, yeastiness, bread-like qualities, with subtle but welcome hops and slight bit of fruit. Mouthfeel - Clean crisp, bone dry finish and lots of carbonation throughout. Drinks easier than 8%. 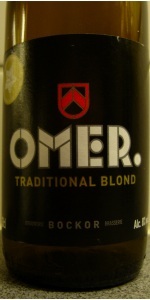 Overall - Not sure why the hate for Omer Traditional Blond, it checks all the right boxes for being a very good and well executed BSPA. If I can't get my Duvel fix, this is certainly a nice alternative. Like a Heineken infused with some sort of saisson, this is one of those brews that you can enjoy but never fully take to. The nose is very much like European lager and the taste is malty enough to claim the same heritage, yet there is enough here not to frighten you off. Quite carbonated, with a lingering head a finger thick, the farmhouse element within keeps you dreaming of St. Feuillen and the like. Worth the admission, though you won't see a home run. Had on tap. Pours slightly hazy,bright gold in color with 3/4 inch head. Taste is apple, bread, and Belgian spice. Light bodied, high carbonation and sweet. Delicious on tap. Looks nice, with a steady head of foam over a deep blond colour. Taste is a tad weak. Some clove, some banana, some malt, some pilsener hops. These flavours also make their appearance in the taste, which is a bit stronger than the smell. Not the intensity i expect from a BSPA though. A bit too much like a Weizen in my opinion, even though no wheat has been used in the process. Same objections for the mouth feel: it's smooth and creamy, which is fine, but not what I'm looking for in a BSPA. Overall a decent beer, but if you want to compete with Duvel and the like, you got to bring the big guns. L - orange hay-esque color; solid foam with great staying power. S & T - smelled like your average pilsner: slightly wheaty, grassy, little bit dry, but surpising in the mouth due to how sweet it was. Caramel-malty. No hoppiness. Barely any bitterness. Just caramelly. I don't quite recommend this one. A bottle from Supermarket in Brugge. It pours perfectly with a good head which lasts. The aroma is pleasant and it is well made. To be honest, I did not like the flavor here, I think it was from the sugar used for the 2nd fermentation in the bottle. Pours a deep blonde color with some sediment floating here and there. Tall fluffy head, full of yeast. Aroma is really, really nice. It's floral, spicy, yeasty. Clove, pepper, bubble gum, lime salt, banana, cinnamon. Flavor is pretty boozy to start, which actually sets it up for being a rough drinker right from the beginning. What follows is clove, bubble gum, white pepper, yeast, spice. The floaty flavors are there but all so buried underneath this formidable wall of pure ABV. Feel is very carbonated, hot and boozy, and a dry finish. Overall, apart from the booze, this might be a good beer. Unfortunately all the flavor is lost beneath the heat. And the worst part is, it's not even that heavy in alcohol content. A big flaw here. A: hazy gold, minimal (about 1 finger) head that dissipated surprisingly quickly. O: don't really know what exactly I was expecting with this beer, I came to it without many preconceptions other than it was a traditional belgian that was decently well thought of and I love belgians so why not. Turns out it's a truly excellent beer with just enough complexity to make one think but enough superficial appeal if one doesn't wish to. Will definitely buy again.